The story of Count Dracula has been adapted, remade, reimagined, paid tribute to, and parodied countless (Get it?) times. 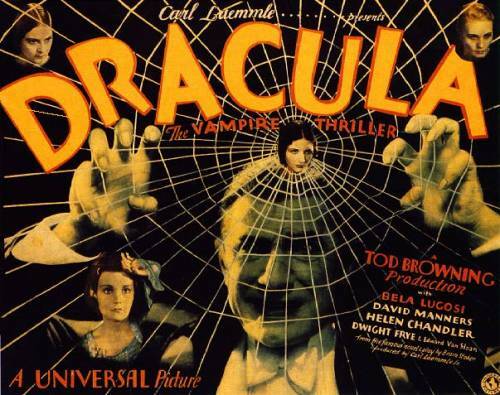 Even other film versions, such as the Hammer films starring Christopher Lee or Bram Stoker’s Dracula with Gary Oldman, have their own parodies and tributes. But it all comes back to this one. If you want to know where the accent, the widow’s peak, and the cape came from, look no further. Dracula’s definitely done very differently than how we’re used to seeing horror movies done. Unless you see the version with the Philip Glass score, the only music in the film is during the opening credits and a scene at an opera. As you may have guessed based on the year it was released, the gore is very, very minimal. The only blood you ever see is when Renfield, pre-insanity, cuts his finger on a paper clip. And yet, the film is still very effective. It’s chilling and suspenseful. As for how the Spanish-language version compares to the English-language version… I am the last person you want to ask to compare different movies. But I’ll give it a shot. On an objective level, the Spanish-language version is longer, and gives some more depth on certain characters and plot elements, such as Dracula’s possible origins, and what happened to Lucy/Lucía after she became the “Woman in White.” This version also shows the bite marks left behind after a run-in with Dracula, though it still doesn’t show his famous fangs. One of the differences that stuck out to me the most was when Dracula confronts Van Helsing alone. In the English-language version, Van Helsing directly opposes Dracula’s attempt to control him (with some difficulty); in the Spanish-language version, Van Helsing appears to be under Dracula’s control… until you find out he’s just faking it to trick Dracula into thinking he discarded his cross. When it comes to which film is “better”… does it really matter? If you have a favorite, great! But it doesn’t have to be a contest. We have both films. We can watch and enjoy them both.